The Best Music Stands - Folding, Portable, Collapsible, & Accessories! When people think of music stands, this is the exact model they're generally thinking of. Seen in churches, schools, studios, & auditoriums nationwide. Nearly indestructible. Rolled edges on the bookplate for safety. Easy to use tension knobs. Can extend to 45" in height. Not as portable as other models. Best used if it will be left in one location, unless you don't mind toting it around. An extremely tough stand designed with portability in mind. Perfect for the student or mobile music teacher, weighing only 6-8 lbs in the bag. Reinforced ribbing to prevent bending while traveling. Comes with perfectly sized bag with shoulder strap & zipper pockets. Magnets will stick to it. It's possible for those not paying attention to over-tighten the tension knobs and strip them out over time. Among the most durable of the wire stands available, this light weight & portable model is attractive for its low cost & convenience-factor. Comes with a travel bag & book light. Includes spring arms to hold paper in place. Collapses to a very small size. The bag itself can easily fit into a larger bag. Best used in areas with no air drafts, since wind can pass through the bookplate & blow your papers around. Not for huge & heavy books. The fact is even the best cheap music stands don't cut it. Thankfully cheap is a relative word. As long as you don't venture into the realm of custom lathe woodworking and diamond-encrusted nonsense, all sheet music stands are cheap. You just don't want to mess around with the bottom rung because they'll break on you thanks to the plastic threading and hinges. So what we're going to do is talk about which features you may or may not want in your own music stand, and then I have a handful of recommendations for you. Because, quite frankly, as long as you're in the ballpark of what I'm talking about here, it's hard to go wrong. You just don't want to get stuck with one that you regret, because these can be one-time life-long purchases. Fortunately for you (and horribly for me) I've managed to use a ton of these. From buying and breaking worthless ones to lending, losing, and having nice ones stolen, I'm basically a guru on these things now. Going through some jazz classes in college exposed me to a lot of options as well. There's no reason for this to be long-winded. I'm going to mention a few items you'll want to consider and then jump right into the reviews of each main type of stand. Music stands are made to hold sheet music, whether on loose leaf paper or in light booklets. The crappiest ones try to capitalize on this fact and are built out of hollow plastic tubes. Avoid that at all cost. 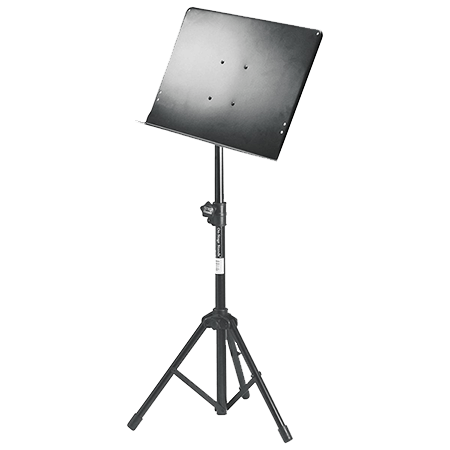 Generally, you should expect a good sheet music stand to weight 5 to 10 pounds. That means two things: it's made of metal (you can use magnets to hold your sheets down) and it has enough weight in the base to have a low center of gravity. Wire-based ones will be lighter, which is the point, but I'm not a fan because they can get bent and gusts of air can blow through and send your sheets flying. This is important because you don't want your stand tipping over in the middle of a performance or practice. The base of the stand is directly related to its stability. You'll see the rare music stand with a round base, but not here. I don't recommend those at all, because they will get bumped into and tip over or at least rock about. It's inevitable, and the result is you have your important pieces of sheet music blowing through the wind and getting out of order at the worst moment possible. You want a three-legged tripod base. There are a lot of tripod bases without collapsible legs but I see no reason to not take that feature since it never costs more. There are some cool add-ons you can find out there to attach to your stand. Of course none of them are critical to a stand's operation or they'd come as a default feature, but they're definitely fun, convenient, and worth mentioning. This is a must for practices and performances in dark areas where you can't control the lighting. Orchestral performances for theater performances often take place under the stage and off to the side where you can't have bright light shining out... you can see how these can be life-savers. 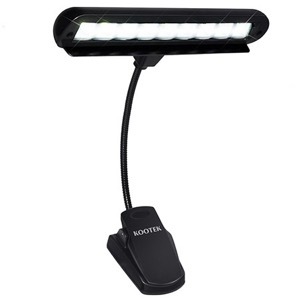 This Kootek light is the currently the best music stand light on the market. Depending on your instrument and where you practice and perform, you might be rocking headphones most of the time. Nothing is better than taking them off when you can sneak a few minutes, and nothing is worse than setting having someone step on them or kick them across the room. Clip-on headphone hangers are a life-saver so your headphones aren't sitting in your lap, chair, or on the ground. You'll know exactly where they are when you need them. P.S. You can find music stand cup holders like this too. If you play a brass or wind instrument, you're definitely going to want one of these. Clip them on in the middle or lower so you don't move you center of gravity too high! There are some music stands with two shelves on them so you can have a separated space to put pencils, your phone, your violin or cello bow, etc. I had a friend with one of these Hamilton Double Shelf stands, with the shelf built in, in his office where he offered guitar lessons. He'd always have extra pens and pencils, a granola bar or banana, a tuner, and all kinds of whacky stuff stacked in the extra shelf. There are standalone shelves, like this Manhasset second shelf, and trays you can buy and clip on but its basically guesswork if you want it to match the width of your stand (and they're plastic, but inexpensive enough that you won't care if it breaks eventually). I like these Dicon trays that hang, too. They can hold a metronome, a tuner, or anything else you might need without getting in the way of turning the pages of your sheet music. That about does it. Let's look at what I consider the best music stands of each category. There are most definitely more than one good option per type, but this isn't really that big of an ordeal. I'm sure you want a recommendation so you can get it done with, so we'll limit it to my personal favorites and that's it. If it's listed, I know it's good because I've used it and know you'll be satisfied without breaking the bank on something over-priced. We'll start with the most common types and move through to the most uncommon. Also, people misuse these terms all over the internet, mixing and matching them like it doesn't matter. Heads up on that if you continue your search past these options. Let's get started with my favorite and then take a look at the less common styles. Collapsible is what most people are thinking of when they think about a sheet music stand. It just means that the top table portion can collapse down and the tripod feet can collapse inward so you can store it in a closet or the corner of the room without it eating up much space. These are typically the most sturdy too. Here's my favorite, the On-Stage stand, because I've had mine forever and it can take a beating like no other I've used. I also like that when it's not fully extended to the maximum height, the center of gravity is even lower giving it a small chance of tipping even when bumped. These are neat in that they can really fold up. Like... big time. You can fold up the tripod feet, drop the steel tube stand down, and fold up the sheet holder portion into 1/5th its opened size. Then you can slide it in its bag. The table portion is plastic but it's fairly thick and reinforced. I've had a doofus knock mine over and it never chipped or anything. If you want something extremely portable, this Peak folding stand might attract you. Otherwise check out the option just below this one too. The Hamilton Traveler II stand is pretty slick if you would rather have one stand to take with you than several where you keep one in each location. I'm the latter type so I go with the indestructible collapsible style, but the Hamilton is equally solid. They don't skimp out on the way the table connects to the neck, which is often a troublesome spot. Their steel and reinforced ribbing keeps everything safe as you lug it back and forth, from the studio to gigs and to practice. I like this particular desktop stand better than other popular options due to the rubber pads. The others seem to all have felt pads. Felt tends to compress and over time will begin sliding, especially when using a heavier book versus paper sheets. Even with the desktop style there's no reason to get something that will bend or break, which is why I like the Proline desktop stand. Some people want a wire-based stand. They know they'll be indoors in a draft-free area, and they might be an elder who doesn't want to deal with moving around a ten pound stand. They have their reasons. I recommend this ChromaCast stand because it's still light but it's not round wire, it's flat sheets of metal, meaning you won't risk bending the table portion so easily (and it comes with a bag and a decent double light). As you read through this then you know what I think is good and bad about music stands. There's not been a lot of changes to the market over time because a handful of companies have done it right. I mentioned what I feel are the best music stands of each brand and style. All you need to do is pick the kind you like and move on with your life because they're all quite affordable. Pick up a couple accessories while you're at it. They make life a bit more fun while you're sitting behind your stand wondering what you're doing with your life. Just kidding!